Sunday Assembly: A Church For The Godless Picks Up Steam There's little talk of God at "Sunday Assembly," but you will find community, music and skepticism. There are now almost 30 congregations in several countries, offering what the British founders of the movement call "the best bits of church, but with no religion and awesome pop songs." Ian Dodd (center), co-founder of the Los Angeles chapter of Sunday Assembly, sings with other attendees. Chapters of the godless church, founded by British comedians Sanderson Jones and Pippa Evans, have been spreading since launching in London in January 2013. It sometimes feels like church in the auditorium of the Professional Musicians union in Hollywood. It's a Sunday morning, and hundreds of people are gathered to meditate, sing and listen to inspirational poetry and stories. But then the live band starts up — performing songs by the Beatles, the Rolling Stones and Jerry Lee Lewis. And instead of a sermon, there's a lecture by experimental psychologist and neuroscientist Jessica Cail about the biology of gender identification and sexual orientation. 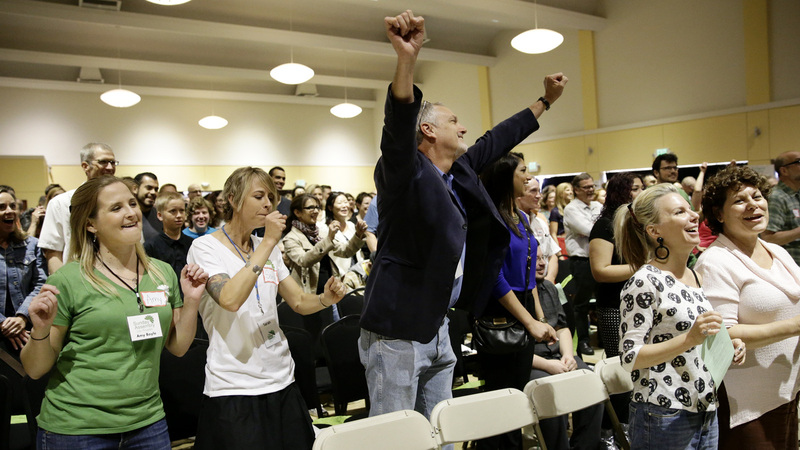 This is a Los Angeles meeting of Sunday Assembly, a church for people who don't believe in God. The brainchild of two British comedians, the movement has since spread across the globe, and there are now about 30 chapters from Dublin to Sydney to New York. There's little God talk at Sunday Assembly, but there is advice by local co-founder Ian Dodd to be authentic. That appealed to divinity student Noel Alumit. "I don't necessarily have to believe what you believe, but we won't tell you what to believe — you know, props for that. Respect. Total respect for that," Alumit says. This was exactly the intent of Sanderson Jones and Pippa Evans when they started Sunday Assembly in the United Kingdom. "There are loads of people out there who want to live better, help often and wonder more," Jones says in a crowdfunding video pitching their idea for godless congregations. "It's all the best bits of church, but with no religion and awesome pop songs," Evans says. "And it's not a cult," Evans adds. "But that's exactly what we'd say if it were a cult," the pair deadpan. This lighthearted approach seems to be reaching a growing number of nonreligious people. "This is a big boom now of secularity — people not wanting to associate with religion, not wanting to identify as religious," says Phil Zuckerman, who teaches about secularism at Pitzer College in Southern California. How Does A Person Go From Believer To Atheist? What Can Atheism Learn From Religion? Zuckerman says his research shows that 20 percent of Americans say they are nonreligious. And among people younger than 30 years old, that number is 30 percent, he says. "Some people who were raised with religion rejected it for certain reason that leaves them with a bitter taste in their mouth about religion: either they had bad experiences in their church, or they saw hypocrisy in the youth pastor, or they felt that religion was manipulative or all the litany of reasons people might not like religion," Zuckerman says. "Those people are a little bit angry at religion." He says Sunday Assembly appeals to more optimistic atheists — those hoping to re-create what they felt was good about religion. "They miss the community, they miss the music, they miss the multigenerational coming together with people that you might not otherwise be hanging out with," he says. "But they don't want to go to a place where they have to keep their intellect on hold. They don't want to push pause on the skepticism button in their mind." Zuckerman notes that there have been secular organizations for years, like the Ethical Culture Society, American Atheists, Humanist centers, some nondogmatic Unitarian chapters and organizations fighting for political and social causes. But unlike some of these groups, he says, Sunday Assembly is not out to critique or debunk religion. That approach is what drew TV animator David Hernston, 38, and retiree Valerie Stansfield, 75. "I don't believe in God, and so going to church, even with Unitarian church, it's not so explicitly God-y, but there's still some spirituality that just doesn't resonate for me at all, so I've been hoping for this sort of community experience for a long time," Hernston says. "I think it will grow," Stansfield says. "There's a lot of people who feel spiritual, they want the spiritual feelings, they want the celebration. It's natural. All humans love it." Ian Dodd, one of the co-founders of LA's Sunday Assembly chapter, is a camera operator for TV shows like Community and True Blood by day. "I got involved with Sunday Assembly about last February or March when I first started seeing the stories online about the London assembly. And by August we had a website and a YouTube channel, and we had 900 people signed up ahead of time, and here we are at our second assembly. We take our nonbelief as a beginning point, not an end point," he says, "because this is the here and now, and this is all we can count on. What is it we're going to do to make a difference here?" The members in Los Angeles were encouraged to volunteer to read to children at a downtown elementary school, to donate blood and to plant some trees with a local charity organization. In addition to Sunday Assembly, Dodd is a member of the Unitarian church in Santa Monica. He was once a practicing Buddhist who also dabbled in various New Age philosophies. "As a young adult, I went off on my exploration and checked out this and that and tried to find something that was bigger than myself," he says. "And I discovered that the universe in itself is bigger and more fantastic and more awe-inspiring than any story that human beings have ever created for themselves." Dodd does acknowledge that Sunday Assembly is not without its factional schisms, like many religions. He says the newly formed chapter in New York has already split over how much to emphasize atheism. But he says the Los Angeles group is staying away, for now, from any kind of dogma, pro or con.